*Cape: here. Top: similar here. *Shoes: here. Trousers: here. 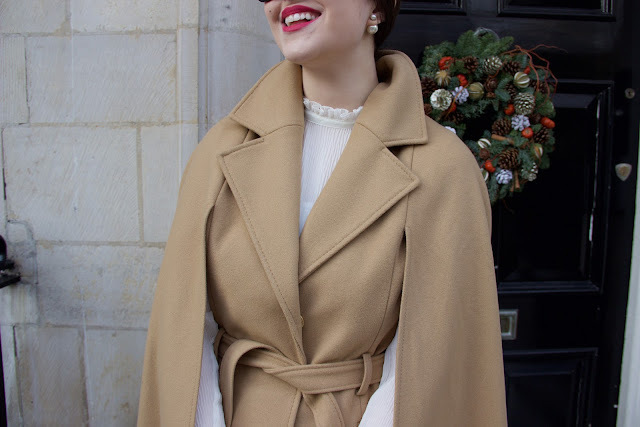 - - - If you're new around these parts, you might not know that my standard fashion formula is a mixture of high end/designer pieces and high street gems - this outfit is the perfect demonstration of that. 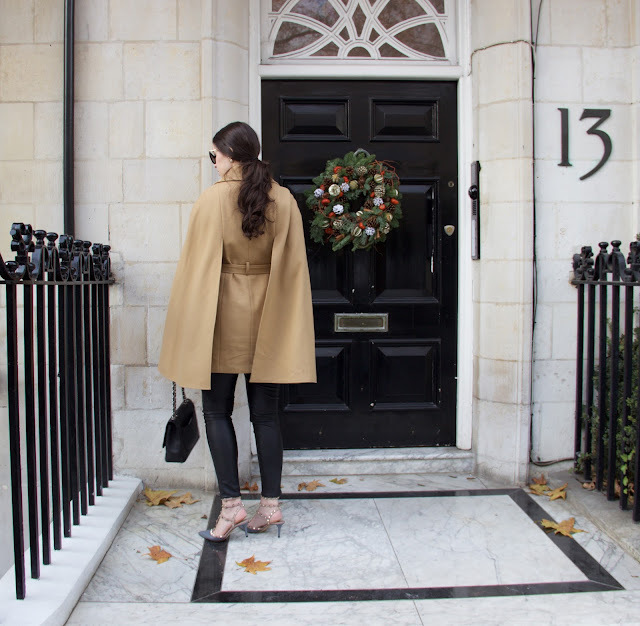 Whenever I wear this cape, I'm inundated with compliments and every time, the person has been aghast when I tell them it's from one of my old high street favourites, Coast. Admittedly, Coast is on the slightly more pricey end of the 'high street' category, but I'd say their pieces are still attainable to a lot of people - so it still counts. 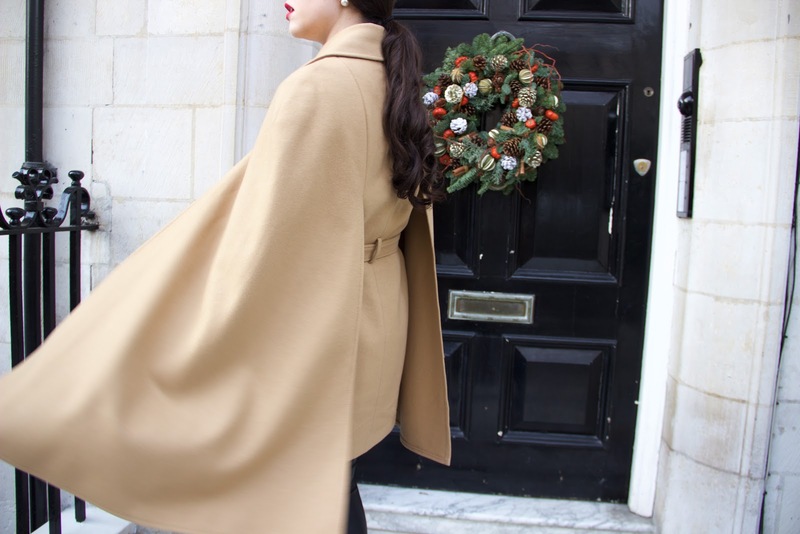 This cape (which is also a fave of style queen Olivia Palermo!!1!) has knocked all of my other coats off the top spot. This cape is my no.1, 2, 3, 4 and 5. I'm besotted. I want one of these capes to wear and another one to frame like teenage boys do with signed football shirts. There's something so flattering about the cut and the way the wing-like sleeves fall and swoosh. To me, it's cool but elegant. I really do think that there are such wonderful, high quality pieces to be found on the high street and this cape is the epitome of that. P.S. shameless self promo: there'll be an OOTD of this look and a birthday vlog up on my YouTube channel tomorrow if you'd like to subscribe in preparation! Love the photos! The outfit looks lovely on you, would never believe this cape was from Coast! Love this outfit, as always, Arabella! You always pull off a cape so well. Also love your choice of rock studs; they're unique enough that they don't look too generic and like the ones everyone seems to buy, but are still a very recognisable style. love them! Those sleeves are just divine!